By Julia Gamolina, Bika’s portrait courtesy NEW INC, photo by Rain Embuscado. 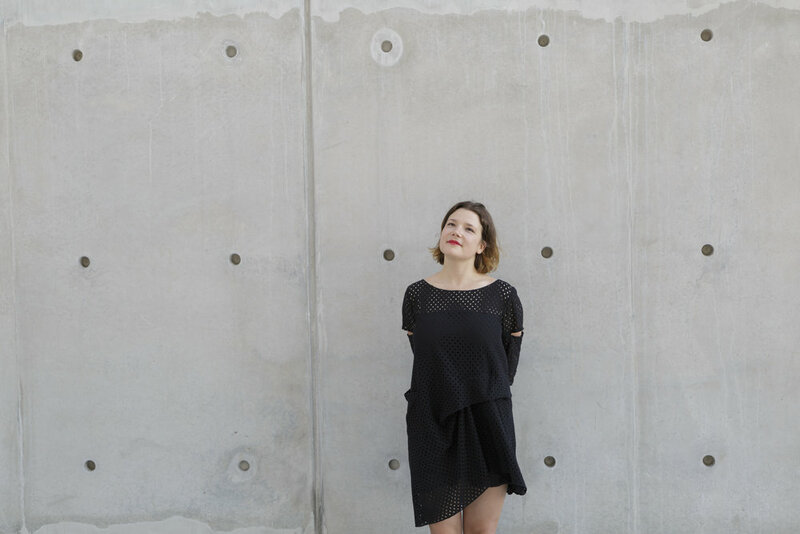 Bika Rebek is the Principal of Some Place, a design studio that focuses on architecture and exhibition projects, with locations in New York City and Vienna. With Some Place, she has co-authored and designed the Slovenian pavilion at the Venice Biennale and has worked with clients and institutions across the world, including The Met, 2x4, Samsung, Sagmeister & Walsh, the Dhaka Art Summit, MAO Ljubljana, and the Museum of Applied Arts in Vienna. Inspired by her work as an exhibition designer Bika Rebek has founded Tools for Show, a collaborative digital platform for curating, designing and archiving exhibitions. Rebek also serves as an Adjunct Assistant Professor at Columbia GSAPP and sits on the Advisory Board of the Future Architecture Platform. In her interview with Julia Gamolina, Bika speaks about finding what she loves and launching a practice, advising young architects to take risks and young women to ignore those who discourage them. BSR: My grandfather was an architect. He passed away when I was a small child, but he left all of his tools and books in his old study and workspace. Being in that space and having these things around me was certainly an influence. When I decided to study architecture at eighteen, all that wasn’t on my mind though - I simply liked the idea of creating spaces, especially from the interior, inside out. I dreamt from the very beginning of making public spaces, train stations. I also loved to draw - my other career would have been to become a comic book artist [laughs]. You studied in Vienna. What did you learn about yourself in architecture school? I was a very confident and slightly eccentric teenager [laughs], and when I started architecture school, my ego broke down into little pieces. Architecture school was the first time I had tried really hard at something and first failed miserably. After the first year, I was actually asked to leave from the school. This is how the system was, very brutal - they asked people to leave all the time. Architecture school in Vienna was a tough place for an eighteen year old girl who knew nothing about the discipline. My professor, this very powerful man, had a conversation with me where he told me that architecture isn’t for me, and that I should be an artist. This brought out a stubbornness in me, and was a real moment of personal growth, because I said, “No, I really think that I learned a lot this year and I can prove to you that I can do this.” He said, “Ok - write me a letter to convince me that you should come back, but you’ll have to work really hard.” I wrote him this letter, and they re-admitted me. How did you turn things around for yourself? At first, the second year was worse [laughs]. I was back, but I was essentially on trial. Then I switched studios, to Greg Lynn’s. By that time, I had developed some technical skills, and Greg’s studio was a totally different world - very digitally focused and much more suited for my interests. That’s when I realized that it wasn’t that architecture school wasn’t for me; I just needed to find my focus and the right environment for what I was interested in. After I realized this, school became great, but I learned that this dynamic was part of this school. Now that I’m teaching myself, I like to share this story with my students because in their eyes, I, as their professor, have “made it”, and I like to tell the students that are struggling that story, that I was at a point when I was asked to quit and it wasn’t because of me. I first worked for Asymptote - Hani Rashid was on my final review in Vienna, saw my thesis presentation, and so I believe I had an edge when I applied to work there. My time at Asymptote was really hard at first [laughs] - the schedule in the office was pretty demanding, however they did give me a lot of opportunity for someone just out of school, and I learned a lot when I was there. The relationships I made there also lasted beyond as I also taught with Lise Anne in her Columbia studio, a few years later. However, as much responsibility and growth as there was, I missed doing my own projects and being really connected to the construction process. I started to build installations in my free time - on my roof, and other random locations - that were super low budget, super fast, and I could just play. I threw parties around them, so that there was reason to bring people in and enjoy. I feel like I learned a lot from this and set the path that I’m still on. How did you get to Columbia? I thought I was done with school forever [laughs], but two years after graduating, it felt like something was missing. At Columbia, I did the Critical, Curatorial, and Conceptual Practices (CCCP) program, which had been the opposite of everything I had been doing at that point; it was theory focused, instead of focused on digital design as I was used to. The beginning was also super hard for me because I didn’t have those tools - I didn’t know how to write or how to formulate an argument in that way, as I was deep into a very particular practice at that point. That was again a moment of feeling lost and wanting to quit, but over the two years and by the time I graduated, I found my focus and interests within the program and I really loved my thesis. I wrote on architectural software; where it comes from, who is innovating it, who are the people involved. With my thesis, I really felt like I combined all that I knew and was interested in. Bika after a review at Columbia GSAPP with her invited critics Vere can Gool, Maite Borjabad and Yu Nong Khew, 2016. What did you do after Columbia? When I finished, I was super worried - I didn’t know at all what I wanted to do, except that I didn’t want to go back to an architecture office, nor do a PhD, and I was broke [laughs]. Then I heard that the Met was looking for exhibition designers. That sounded super interesting, so I applied, and got the job. That position was perfect for me - it combined being on site all the time and immediate construction since exhibits go up so quickly, but it was also an academic practice because you engage with curating the content. I really enjoyed it, especially being at the Met every day - walking through the empty museum every day in the morning was incredible. We were also opening the Met Breuer at the time, so I worked on some permanent things, like the renovation, the lobby, and the restaurant. I also worked on Manus X Machina, the Costume Institute’s exhibition. I had an interesting role because obviously OMA was the designer of the show, and we at the Met were coordinating with everyone and communicating with OMA, and then also designing little bits just because it was easier with us being in house and being able to design something very custom for the building. I felt like I had both a designer and a producer role. Bika at the opening of HOT AIR, a lofi architecture gallery she co-founded with her friend Matt Shaw, 2018, photo by Cezar Nicolescu. You started Some Place after your time at the Met. How did you decide to go off on your own? I still feel like I jumped off of a cliff [laughs]. I was really at a crossroads because I was on a freelance contract for two years at the Met, and they finally offered me a full-time job. It would have been a job that I loved, my favorite job so far, and working with a great group - the design department there is a very tight, collaborative community of architects and graphic designers and I loved that. I worked closely with a few incredible curators, and that was amazing. I thought I would live and work uptown and go to openings at the Met, and I could picture that life for me. The whole time I was at the Met though, and even back in grad school, I was working on projects back home in Vienna - mostly for family. In the same month that the Met offered me a full time job, I had an opportunity to build an extension to an existing building in a small village outside of Vienna. I knew I couldn’t do both, so I decided to go to Vienna for a month to work on this project and see how it went, but after a month I realized that I had to keep going, so I didn’t come back and stayed in Vienna for six months. That’s how the practice was born. Bika with her friend and collaborator Daniel Prost in front of the construction site of the SML factory building, 2018. What happened after those six months? Even though it was a small job to start with, since I was working for myself and on my own schedule, a lot of other things followed. Another family project came through in Vienna, a much bigger one - they built a whole new factory, something I had worked on before, and I ended up designing the office building for the headquarters. That kept me busy for half a year, and then I pitched another seminar to teach at Columbia. The drawing and representation class I was already teaching was one thing, but this seminar was new and based on exhibition design and temporary installations, rapid prototyping in an analog and digital way. I created the syllabus and the class was in two parts - Ready for Replicas and Tools for Show. It’s a visual studies class but also a theory class since you’re asking what it means to be a replica and what is its relationship to the original and its relationship to its environment as compared to the original. I was really excited about the possibility to teach my own class, and I loved the idea of coming back to New York - New York has always been this place that keeps pulling me back. Bika presenting Tools for Show at the Museum Summit at NEW INC, 2018. What have been the biggest challenges in running your own practice? The first was actually the project that launched my practice. It never materialized - we made a proposal, and it was too expensive so we revised, and revised again, and the process took too long, and we ended up losing the project. I also had a business partner back in New York, and I broke off that relationship around the same time that my project ended; it was a challenging time in terms of personal relationships all around. When I came back to the States to teach, I became a member at an incubator at the New Museum, called NEW INC - a co-working space with a special mission to support artists and designers at the intersection of art and technology. The incubator uses the same methods that tech start-ups do, for example with workshops about finding your real values, and thinking about where you’ll be in five years, which I found isn’t really something you do in academia or traditional architecture offices. Being there was what fast-tracked the process of ending my relationship with my business partner. So acting on that and disentangling that relationship was a huge challenge. Bika at NEW INC, with her friend and collaborator Lucia Tahan, 2018, photo by Lucia Tahan. I still need advice with that myself [laughs] - I would say to focus on creating a business plan from the beginning. I started when I already had projects, so I was too busy to think about my approach or strategy, and it is something you need to be intentional about. What advice do you have for young architects in general? Risk-taking is really important, especially for women. Have you heard that women only apply for a job if they fulfill every single qualification in the job posting, and men apply if they fulfill 60%? My advice for women is to act like men in that regard. Also, the people that have made me feel really small and that have made me want to quit architecture have always been men - in school, at various jobs - and I would advise young architects to not fall into that. Women really need to ignore it, and understand that it’s not about them. That’s something that as a young woman, I wish I had known. Bika on site of the SML factory building, 2018. Bika presenting at the Future Architecture conference in Ljubljana in 2017, photo by Peter Giodani. What has been your general approach to your practice and to your career? My approach comes back to what I said at the very beginning - wanting to create for the public. An office building isn’t the most public necessarily, but working on a project like that made me feel like I was making a difference in people’s lives since so many people would work in and use the space. That’s one thing that’s really important to me - I want to work out in the field. That being said, I also really enjoy exhibition design because I love to work with the content - you really get to know the subject matter well, and it's definitely something I want to continue in my practice. In terms of a more general outlook, I believe in risk-taking - seeing opportunities and inserting yourself. People sometimes say to me, “It’s been so easy for you, look where you’ve ended up,” but I feel that I’ve taken thousands of chances that haven’t worked out, and people just haven’t seen them. Finally, what have been the biggest highlights and what are you most proud of? The number one highlight was this spring - walking onto my first construction site and seeing the raw concrete. I love exhibition design and software, which is what I’m doing at the incubator, but the happiest moment of my architecture life was definitely that moment. Just a few months prior, there was only dirt and a hole in the ground, and now I saw all the workers who were making it real. I remember showing up in a pink outfit [laughs] - definitely a special moment.